Thai Yoga Massage finds its roots in the Indian medicine system known as Ayurveda, it is said that the massage was developed by The Buddha’s own physician, Jivaka Kumar Baccha, known in Thailand as Dr Shivago. The massage works primarily on the Sen Energy lines of the body, which supply the body with energy for its healthy functioning. Have you felt stressed to later find tension in your backs, jaw, neck and shoulders. This stress induced tension has impeded the flow of energy around the body or in our emotions and needs rebalancing so that our physical, emotional and mind systems can flow freely. Wearing loose comfortable clothing, for example joggers or leggings and perhaps layers on the top of your body, you will lay down on a futon mat and using just my body weight, I move and apply pressure to the body focusing on the Sen energy lines. Using my thumbs, palms, elbows and feet, I am able to use a combination of acupressure, rocking, twisting and facilitated yoga stretches to create a steady meditative rhythm. 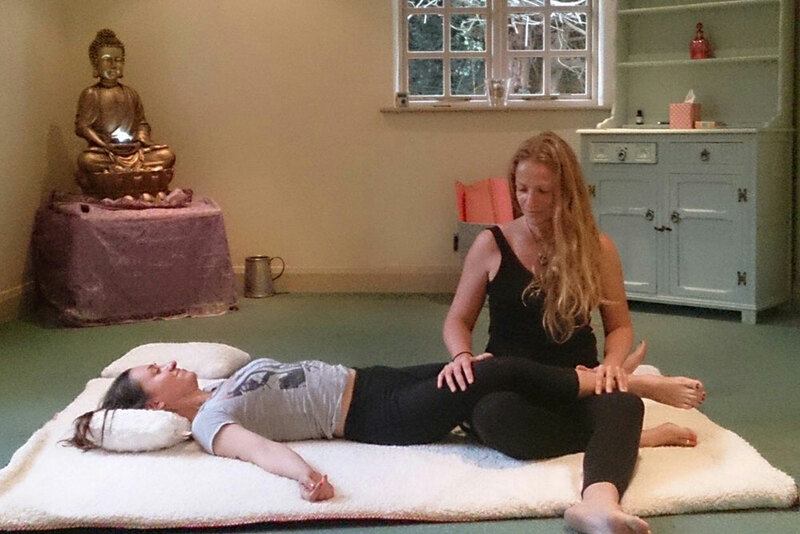 Thai Yoga Massage for women, gently restores a sense of well-being, you may find you drift into a deeply relaxed state, the same space just before sleep comes. Melt into the gentle rocking movements feeling your body release layers of tension, allowing the mind to rest in the stillness within. You’ll leave feeling nurtured and nourished on every level of your being. Traditionally a Thai massage is between 1.5 hours to 2 hours, although longer and shorter treatments are available upon request. I have recently experienced a 90 minute Thai Yoga massage by Sarah which was amazing and unlike any other relaxation massage I have ever had.